LAF all the way to the Bank! 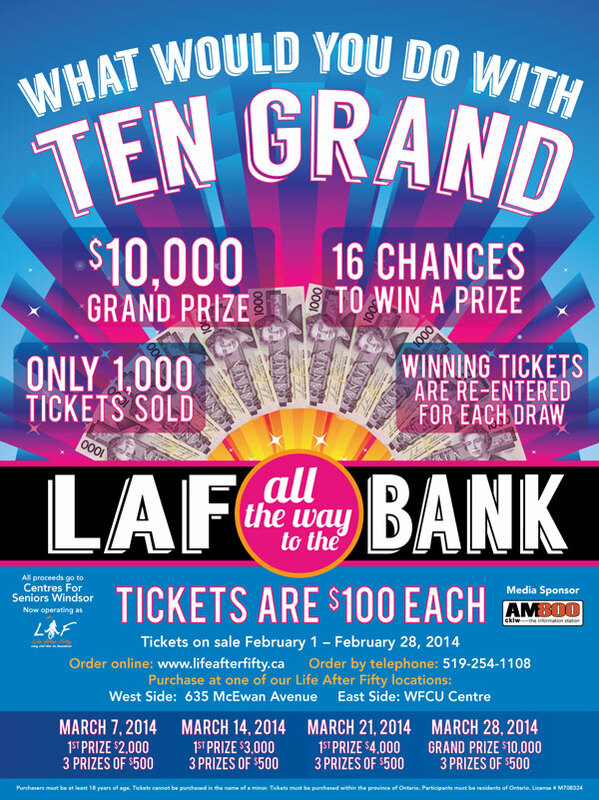 Get your LAF all the way to the Bank Lottery Ticket Today! Get Your Ticket Now! - Don't Miss Your Chance to Participate in this Exciting Lottery! 1 in 1000 Chances To Win Each Week! Winning Tickets are Re-Entered into the Draw! All proceeds from this raffle go to programming at Life After Fifty. LAF strives to provide innovative and interesting recreational, educational and social programs for older adults in our community. We promote active living and we passionately believe that living well has no boundaries. Windsor, ON – Due to current weather conditions in the Windsor area, the Life After Fifty (LAF) East Side Centre (located in the WFCU Centre) and the LAF West Side Centre (located at Wyandotte & Campbell) announced today that they will be closed for the full business day and will not be open to the public on Wednesday, February 5th. 2014. The Weather Network announced a Snowfall Warning for Southern Ontario and the Windsor area, which is still in effect. “The safety of our members, staff and the general public is our first priority,” said Life After Fifty Manager of Communication & Development, Caitlin Shanahan. Life After Fifty will re-open on Thursday, February 6th at 8:30am.